Curator musicians Joe Morris and Stephen Haynes join their invited guests for freely improvised music, created in real time. The listening environment encourages intimate and deep contact with the music, the musicians, and other audience members. On Sunday, December 13 at 3 PM, we continue our fifth Improvisations music series with fresh talent under the title Improvisations::Arcade. 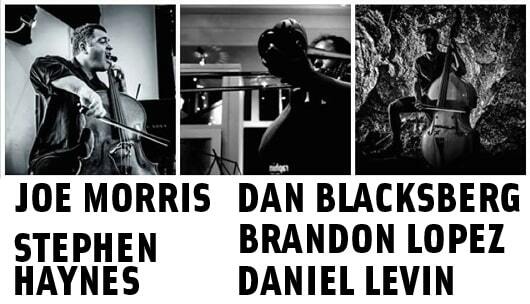 Sunday’s event features Dan Blacksberg (trombone), Daniel Levin (cello), and Brandon Lopez (bass). DAN BLACKSBERG is rapidly emerging as a new leading voice on the trombone. With musical activity that spans avant-garde jazz, modern classical music, improvised music and klezmer, Dan brings a burly, rough-edged sound intended to push at the technical and textural extremes of his instrument. Based in Philadelphia, Dan leads a variety of groups, such as the Dan Blacksberg Trio and Electric Simcha, and co-leads groups such as Archer Spade, the New York/Philadelphia avant-jazz quartet Bird Fly Yellow, and the terror-improv group Psychotic Quartet. DANIEL LEVIN is “one of the outstanding cellists working in the vanguard arena” (All About Jazz), “ridiculously fluent, virtually overflowing with ideas” (New York City Jazz Record) and “very much the man to watch.” (Penguin Guide to Jazz). No matter what setting he plays in, cellist Daniel Levin occupies a musical space bordered by many kinds of music, but fully defined by none of them. Born in Burlington, Vermont, he began playing the cello at the age of six. In 2001, he graduated with a degree in Jazz Studies from the New England Conservatory of Music, and arrived on New York City jazz scene shortly therafter. Since then, Daniel has developed his own unique voice as a cellist, improviser, and composer. SUNDAY JAN 24 | 3 PM: Yasmine Azaiez (violin), Adam Matlock (accordion), Stephen Haynes (cornet), Joe Morris (guitar).